The dog with his bone. An archetypal image. Everyone knows that dogs love bones. Aesop knew. Early painters knew. Most people know not to approach a strange dog with a bone - they know it’s the highest value item and not to be shared. Or even looked at. So WHY do people act so surprised when I tell them I feed my dogs bones as a regular part of their diet? Indeed it’s the basis of their diet! There seems to be an awful lot of mythology out there about bones. This has coincided with the huge upsurge over the last forty-odd years in commercially manufactured pet foods. Is this disinformation put about by the pet food companies (innocently or otherwise)? You only have to look at a dog’s mouth and teeth to know that raw bones are what they are designed to eat. They have small ripping and tugging teeth at the front. Their canines on the front corners are what would have brought down their victim and ensured it had no escape - it would also probably dispatch the animal with these teeth. The back teeth are for cutting and crunching big bones. Dogs have a scissor bite, and can’t grind their back teeth as we do to break down cereals and vegetation. They chomp and swallow. Digestion takes place in the gut, not partly in the mouth as in our case. And this is why they are unable to break down cellulose and digest vegetation. One of the reasons they will go for the stomach of their prey is because the nutrients are already broken down by the time they get there (either through the long digestion process or via the four stomachs), and are therefore accessible to them. These jaws are immensely powerful, and dogs can use their back teeth to cut through rope or crunch through bone - quite large bones too. And they can clamp down on a rope to grip it without cutting it . It’s a measure of their exquisite sensitivity and control that they can also carry a puppy or a fresh egg in their mouths without causing any damage to their burden. Over the last few thousand years of living alongside humans, dogs have adapted to be able to eat more or less anything. But their mouth and digestive system is still the same. So it’s clear that raw meaty bones, with flesh to be ripped and tugged off, hard bone to crunch and mash, and marrow to be licked out, are ideal food for the dog's eating and digestive machinery. Add to this that they get a full-body workout while attacking a bone: they really have to put their back into the work! The paws will hold the bone in place while they rip food off it. They can stand on the bone and heave against it to strip off the valuable meat and sinew. They stand, lie, move around their prize. At the end of this meal - which can go on for 30 active, hardworking, uninterrupted minutes at a stretch, they are tired! Instead of hoovering up a load of flavoured carbs from a bowl in a matter of seconds, they can extend the eating sequence to a very satisfying hour or more till they have a quick wash and brush-up and doze off over their bone. What’s more, these bones will gain in favour and flavour as they age. If you’re squeamish about this, institute a bones-only-in-the-garden-or-outside-kennel rule. (I have a no-bones-upstairs rule. They learn it very fast - just give your dog the choice of staying downstairs with his bone or coming up without it: it’s up to him.) The soft tissue is soon removed from the bone, and the resulting white bone will be revisited and chewed and gnawed for weeks. It’s not a fly hazard - certainly not in our temperate climate, though I appreciate that that could be different if you live in a hot climate. Is it dangerous for the dog? I have heard horror stories about dogs getting blockages or cracked teeth from eating bones. I can only say that in 30+ years feeding a raw diet to 3-4 dogs at a time (so that’s over 100 years total! ), I’ve never had such a problem. I don’t feed marrowbones or any weight-bearing bones of cattle, as they tend to be too hard and mature. The essence of my dogs’ diet is that it’s at least 50% raw bone. Pigs’ trotters, chicken and turkey carcases all fit this requirement. Beef bones, even meaty ones, have a higher proportion of bone, but a couple of meals of offal or fish or raw eggs balance this out nicely. In case you’re confused by this, just remember that raw bones are fine. It’s cooked bones we’re warned against, as the cooked bones can splinter. It's entirely your choice what you feed your dog! The important point about dog-feeding is that you give your dog the nutrients he requires. As long as you do your homework and provide your dog with the right food, you can do it any way you like - home cooking, commercial kibble, raw meaty bones. This is not an area for crusades! Of course you can mix and match too. While switching kibble seems to need an adjustment period of a few days to allow the gut flora to catch up, you can feed raw straight away without this changeover period. So you may choose to have a bone day once or twice a week. There are some very good commercial dog foods available - indeed I always have a Bob & Lush backup bag of food handy in case I’ve ever forgotten to defrost something. With four dogs you can’t just open a can of sardines if you’re caught short! I'd also take kibble for some days on camping trips. Dogs are able to cope with pathogens that would make us ill. In other words, wash your hands and utensils after preparing their raw food. While it’s more awkward preparing raw treats, it’s a good thing to do with a puppy, when all his meals are coming as training rewards. You can get some terrific poultry shears and cut necks and wings up very small. How can I tell what commercial dog food to buy? But bag foods are very variable in quality, and you have to do some research to find the right one. Just because it comes in a bag and has a pretty picture of a dog on it, doesn’t mean it’s any good. They are definitely not all created equal! I recommend you have a cruise round www.allaboutdogfood.co.uk and learn about what actually goes into a lot of these manufactured foods. This site is run by a canine nutritionist and is not affiliated to a manufacturer. You will still learn a lot from it, even if you are not in the UK and have different brandnames where you live (though you’ll see some are global, and many brands belong to just the same few companies). The principles are the same, and they have a simple star-rating to make it all easier. You'll find all the ready-prepared raw foods in the 5-star section. You see - you don't have to fell an ox every month and do it yourself! And as a halfway house between fresh raw food and the convenience of dry kibble - UK readers may like to check out Butternutbox.com where you can get really delicious "home-cooked" food specially designed for your dog and his likes and dislikes. You can get a huge discount off a three-week trial, without obligation! Go check it out! You need to research carefully and get the best food that fits your budget. The better the food you feed, the less you’ll see of your vet, so you’ll save money in the long run! And if you’re a vegetarian or a vegan, then that’s fine for you, but keep in mind what your dog is designed to eat. I wouldn’t feed a horse rump steak just because humans can eat it! You have to feed what the animal is programmed to eat, digest, and benefit from. You have to take even more care and study to provide the required nutrients for your dog with any form of restricted diet. Will my dog growl over his bone? You can introduce bones to a dog at any age but - be warned! He will say, “Oh my gosh, this is REAL food, this is the first REAL food I’ve ever had,” and he just may guard it to the death. This may appear comical in a 7-week-old puppy, but it’s not: it’s serious. So first time out, just give him his bone and let him get on with it. When he’s finished and gone out of the room, you can gather it up if you wish. If he gives you a stony glare, whites of eyes showing, lips flicking, head rock-still over his prize, then on no account try to take it from him - you may well force him to bite you. Wait till he’s out and take it then. Now you can embark on a program of swapping good things for equally good things. Never challenge a dog who is guarding something, and never try to take it away. Once you’ve practiced lots of swapping, he’ll know that you are not trying to take something away from him - rather give him something better. Then you can graduate to two similar bones. If you have a dog-owning friend who has some well-gnawed second-hand bones - rather than fresh, red, meaty ones - these would be an ideal start. My four dogs are at the moment contentedly munching bones near my desk. Every now and again they move about, swap bones, and carry on. There’s never been a bone-fight here, ever, in all those 30+ years of feeding multiple dogs bones. And I very seldom visit the vet. Just the odd stitch for an injury. My dogs are wonderfully fit and healthy. So by all means give your dog the bone he craves. Just be sure it’s a raw bone. 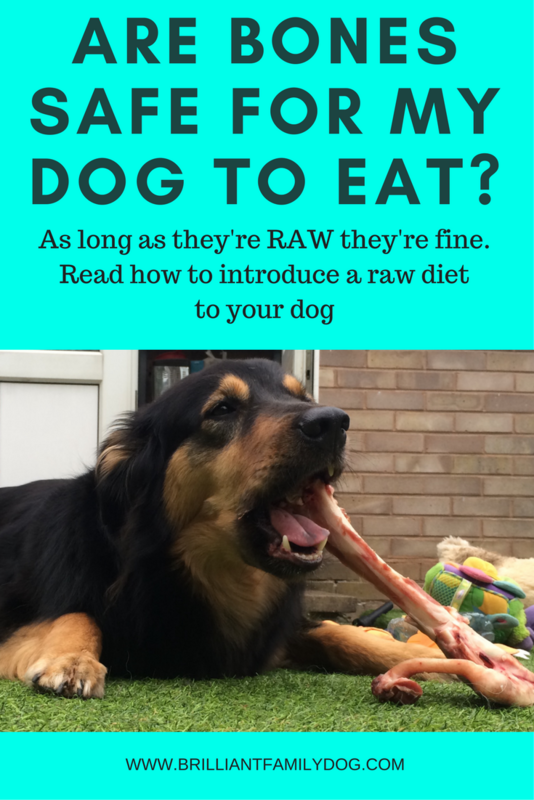 Tagged: dog feeding, dog raw feeding, dog diet, Can I give my dog bones, give a dog a bone, barf diet, dog kibble, cooking food for dogs, what is raw feeding, is it safe to give my dog bones? Digging, Chewing, Chasing, Barking: Instinctive Drives you Love or Hate?